He’s black and white. He’s lightning over the first ten yards. He’s utterly fearless. Unfortunately, he’s a rabbit, though he is called Peter. My little girl named him after the, to be honest, quite badly behaved one with the blue coat. But in my heart, he’s named after Peter Beardsley. 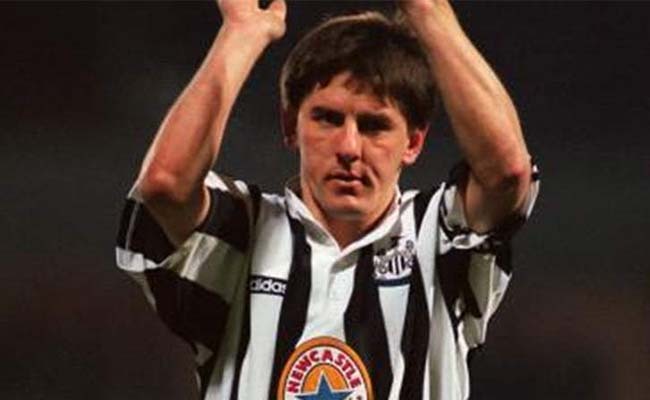 Peter Beardsley is probably my favourite Newcastle United player that I got to see. I was too young for the highlights of the 1970s, although I did get a penny floater signed by Terry Hibbitt when he had the newsagents at West Denton shops. I’d seen him play as the sideburns of the seventies became the extra-short shorts of the 80s, but my dad reckons he was even better first time around. So for me, Pedro was different. I saw his dawning and second coming. In the blue skies of my memories, he was grace and strength, and when you watch clips on You Tube, the years have not dulled the moments. His goal against Brighton, winning the ball and chipping a tall and very impressive Joe Corrigan, was trickery from the soul. If Wayne Rooney did that today, Clive Tyldesley would wet his Manchester United knickers. But this isn’t my favourite memory of Peter Beardsley. Years ago, in the media-strained week after Newcastle United played Arsenal and awful rumours surfaced of the hotel antics of Kieron Dyer, Peter was due to award the certificates for the Awards Evening at the school I worked at. I had never seen the hall so packed. And Peter was late for school. We had to start without him. A message came through that he was on his way, and a lookout was posted at the school gate, ready to radio in when he arrived. The plan was: as soon as he arrives, stop the awards, wait for Peter, continue with the man himself. What could go wrong? When Peter arrived at the gate, there were only three kids left to get their awards. The others had been given out very, very slowly, just so Peter could give out as many as possible. In he walked, with the shuffle of a man who has played football forever. The hush across the hall had the deafening silence you feel in the middle of the night. All I could hear was the sound of Pedro’s footsteps, and the blood rushing through my ears as awe flooded the room. Peter shyly and slightly nervously addressed the expectant families and kids. It wasn’t going to take much, but forgiveness was instant. “If any of the kids would like their certificate signed, or a photo, that’s no problem,” he went on. I’m sure there was something in my eye. Peter Beardsley, the magician who had pulled a rabbit out of the hat against Brighton twenty years earlier, had done it again. He had enchanted the crowd with genuine substance in his performance. Every kid had their photograph taken and certificate signed. Every question in the Q&A was treated with respect, thought, and insight. This was better than any TV interview, because the questions we wanted to ask were answered without cliché or hollow promise. Class is permanent. So every time I feed the rabbit, I have a little think about the Peter Beardsley step over, and the perfect lob. Just before our furry so-and-so slides down the ramp in his hutch on his rabbity bum. Our current team have the potential to get out of the relegation mess. To be heroes. To be some dreamy kid’s ‘I was there’, thirty years later memory. They are someone’s first match and defining moment of supporting Newcastle United. We’ve seen patches of light in a stormy sky. Now I want to know what could rename the rabbit. Mbemba bunny? Wijnaldum Wabbit? I just don’t want another Fatal Attraction! Now if a black and white rabbit can evoke memories of a sunny day in 1984, which names take me to the Brave New World of let downs and loss? Because you can’t name your pets and kids after footballers you can’t stand, even though you’ve never met them. There are the obvious ones. ‘Marco’ ranks right up there. And Eminem can keep Stan, because coupled with ‘Collymore’, we can pinpoint the moment that hearts were actually broken. Mind, these days, you don’t get many kids called Stan. Or Stanley. I thought there’d be loads after the Eminem adoring youth started making baby Eminem fans, yet there are very few. But it’s a shame, because it’s a great name for a rabbit. So what would we call our dog, should we ever get one? I think I’d go for a very confusing Peter. Or Withe, but this might sound weird after you’ve chucked a stick for him to ignore. This would be after the centre forward Peter Withe, who famously chased down a pooch during a match against QPR just before Christmas in 1979. This is the match I most regret not going to. My dad had asked me if I wanted to go, but I went to a Christmas party because Santa was going to turn up sometime in the afternoon. 4-2! What was I thinking! If we got a cat, it would have to be named after a goalie. Steve Hardwick? Err… how about Budgie? God, this is confusing. The great Russian goalie, Lev Yashin, was nicknamed the Black Cat because of his black football strip. Now as nicknames go, that could create issues in Newcastle. I wonder if any Nissan FC fans have pet magpies.